Instagram Testing Out New Format for its ‘Story’ Options — CROWD. Instagram lovers beware! There are some new changes coming for your Story options. A new format has been developed which is about to change the traditional photographic process of the app by adding a selector wheel to choose the options you want to use. Thе latest Social Media update was first spotted by the social media hacker Jane Manchun Wong, who notes that the camera modes in this new layout have been reduced from eight to just three. However none of the old options have been removed, but instead just categorised into a few new elements. For example in the current ‘Stories’ camera at the bottom of the screen you can find the options ‘Boomerang’, ‘Superzoom’ and ‘Rewind’, whereas in the new format each of these would now be available under the ‘Normal’ or ‘Create’ options with ‘Live’ remaining its own mode. Even though this new flow of the options’ arrangement may cause some difficulties in users, as it will take them more time scrolling around till they add all the effects they want, the rounded selector format will make it easier to do so. On a second thought this might be a good addition to the Instagram features, if the platform actually decides to go ahead with it. 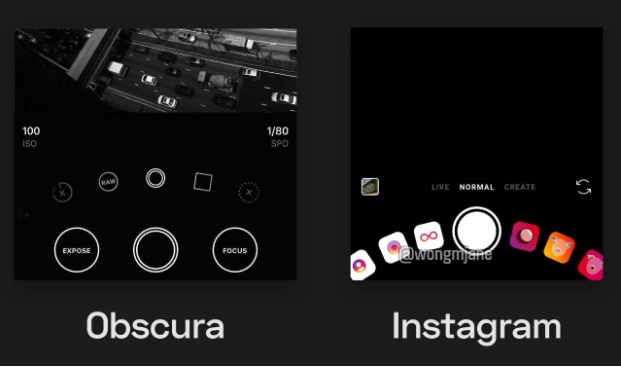 In fact, some observant users have pointed out that this format has already been used by another photo app- Obscura. This app is proven to be very popular among the users, willing to pay a little extra to get more professionally looking pictures. Without a doubt the new format would make the Insta Stories easier to understand for newcomers. By adding the wheel, the process would be more responsive, interactive and appealing, which would presumably expand its usage even more. Although the changes haven’t been confirmed yet, it looks like an upgrade that is worth the try.